Internet Governance Forum Paris 2018 / 14 November 2018, UNESCO Headquarters. 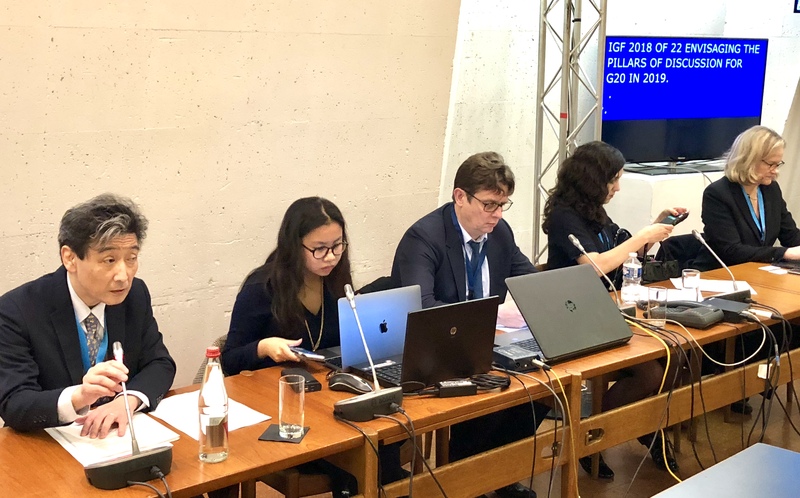 Open Forum : IGF2018 Envisaging the pillars of discussions for G20 in 2019 organized by Ministry of Internal affairs and Communications (MIC) Japan and Ministry for Europe and Foreign Affairs France. Étienne Parizot, astrophysicist and university professor in Paris and Natacha Quester-Séméon, entrepreneur, spokesperson and founding members of the movement #JamaisSansElles, Head of Delegation for France of the Women 20 Summit in Buenos Aires. What is your message to G20 and G7 governments and how the multistakeholder approach can be improved in these fora? We represent the Association #JamaisSansElles (which means “never without her”, plural form, so “never without them, women”). It was founded by several key stakeholders in Digital Economy in January 2016, and quickly development into a very active and expanding movement, originally through the social media, and beyond. Natacha is actually the spokesperson of the Association, so the only reason why I am speaking here instead of her is that she is not fluent in English, so given the short time we have, I will try to convey our message. In just one word, #JamaisSansElles is promoting gender diversity and women inclusion in all sectors of the society, through a very simple and direct action, which does not need any special policy and can be applied by anyone, immediately: by signing the #JamaisSansElles pledge, I commit myself to never participate to any panel, conference, or expert committee if there are no women. It’s pretty obvious and straightforward, but it proved remarkably efficient in encouraging the organizers of events or committees of any sort to indeed pay attention to gender balance. 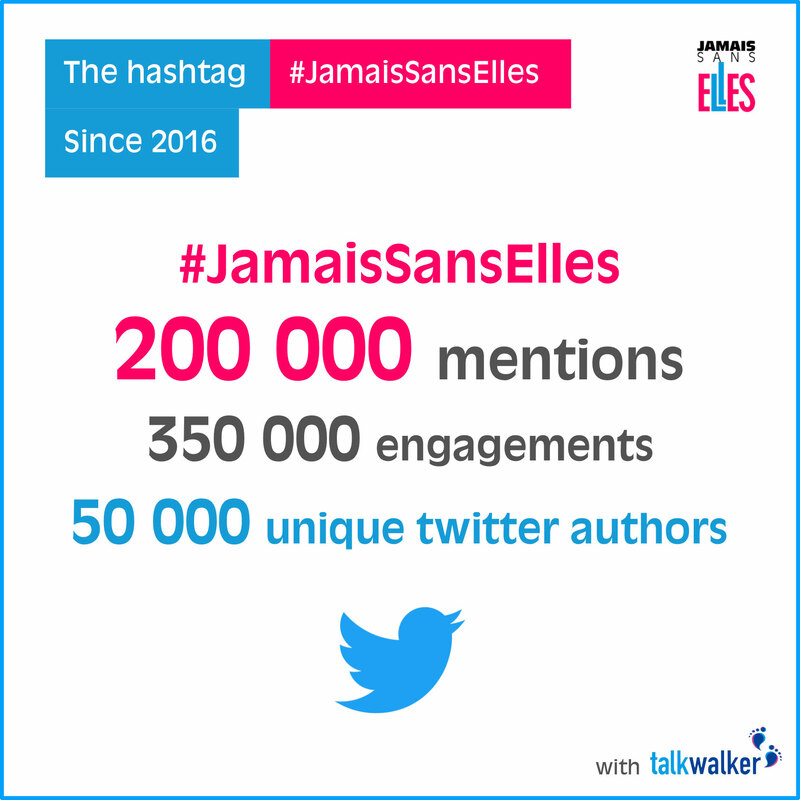 And as a matter of fact, many prominent stakesholders in the digital world and beyond have adopted the #JamaisSansElles pledge and promoted it in their environment, with very concrete and enduring effects. Then the movement extended into the political world, with many deputies and senators joining in. And since the social media are now very efficient in spreading pictures of all-male panels and round tables with the #JSE hashtag, such commitments cannot be just words: it has to be effective: the citizens are watching! An important step was the commitment of the French Diplomacy with #JamaisSansElles, with the French Minister for Foreign Affairs Jean-Yves Le Drian and the Minister for European Affairs Nathalie Loiseau, not only signing for themselves and their administration, but also encouraging all French ambassadors and consuls around the world to commit themselves as well, and indeed many have already done so. This, by the way, owes a lot to Ambassador David Martinon, in his former capacity of Digital Ambassador for France. And the pledge is now spreading abroad as well, notably with the German Minister of State for Europe, Michael Roth, who is now an active member and promoter of the movement! In the course of its development, our main actions have also extended beyond the issue of women visibility, which again is or should be pretty obvious, to focus also on women access to key leading position in all types of environments. Anyway, we are here today because we have been actively participating to the Women 20 process in preparation of the G20 summit in Buenos Aires in two weeks from now. We were actually invited by the Argentinian leaders of this Engagement group to work along with 100 Delegates from the G20 countries, with very different profiles. So this has been “multistakesholderism in practice” for several months, and it led eventually to a series of recommandations finalised during the W20 Summit in Buenos Aires last month, where Natacha and I were the head of Delegation for France. The main thing we learned from the process is that multistakesholderism is fascinating, but also absolutely crucial when it comes to addressing issues in somewhat disruptive domains – disruptive in the sense that they interact with the traditional organisation of the society, whether of the work or of the relations between people, in a way that offers remarkable opportunities, but also carries some threats, possibilities of destabilization, and potentially people left along the way. This is the case for the various Women inclusion issues, and this is the case for Digital inclusion. And as it turns out the two aspects are not unrelated. Indeed, the digital economy can be a very powerful tool of empowerment, through digital entrepreneurship, obviously, but also by giving access to much larger areas of activities and also more opportunities for visibility, influence and participation of individuals. But because these new horizons open in many different ways, at different paces, in different contexts, and leading to different types of back-reaction or side effects (positive or negative), multistakesholderism is indeed crucial. And what we personally learned from this experience, and all the participants to this year of exchanges and interactions would probably agree, is that it can be indeed very efficient. So a first message, regarding multistakesholderism, is that what is actually needed is not representativeness per se, but most of all *expertise*. And no one has universal expertise! And because the Digital economy is so pervasive, it is bound to raise problems in all sorts of areas, and require expertise that may not have been anticipated in the first place. An interesting example is the way AI suddenly proved to develop very strong gender biases is specific contexts. So you don’t want everyone onboard to be able to say: “look, we are very considerate and inclusive”. You want on board all the people who can actually contribute and show others what they would not see or be able to think about by themselves. And *therefore* you need to include different types of stakeholders. Anyway, to come back to the process itself, it was developed through a series of online meetings, with webinars, sharing of experience, exchange of documents and information, etc. Four areas were considered separately (with some links of course): Work inclusion, Financial inclusion, Digital inclusion, and a last focus on Rural Women issues, which was a specific topic put forward this year by the Argentinian leadership. As an Association particularly active in the Digital ecosystem, we of course contributed more specifically to the Digital inclusion component, also including Education issues. In addition to the online interactions, each of these components had a physical meeting in the form of a workshop, each in a different country (the Digital inclusion one was actually in Paris), where a report was produced and agreed upon. 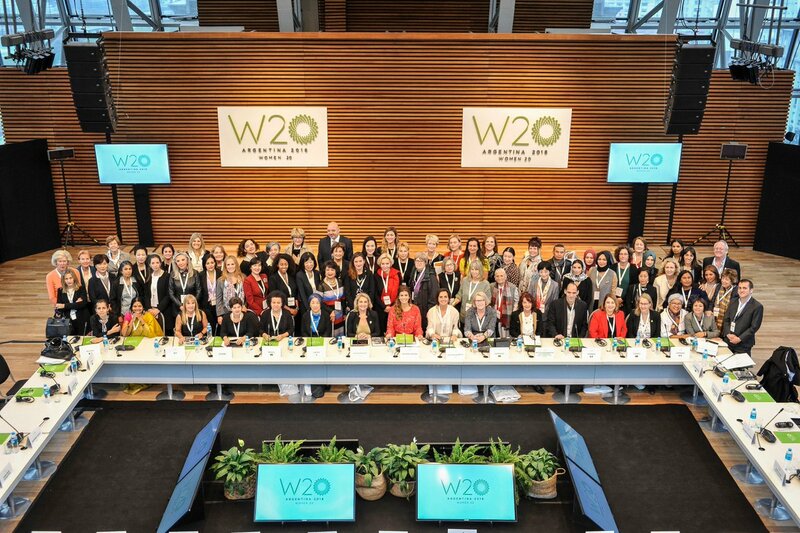 Finally, 65 Delegates were able to meet in person for the W20 Summit in BA last month, where the official Communiqué was finalized and approved, with 15 recommendations, 3 of which focus on Digital inclusion. But this requires true interactions, over time, to better know each other’s problematic, and gain wider knowledge and expertise, to be included in our own views and preoccupations. So this is another important message: we need time to be efficient. And we need to build a community. 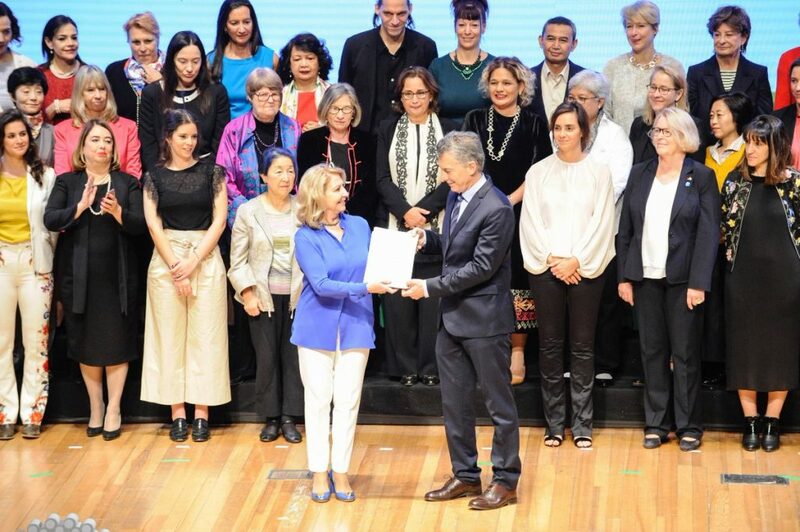 This is indeed one of the endeavors of the Argentinian women who led the W20 this year: to be able to keep the ball rolling, and turn the intense activity that took place on this occasion into a longer-term process, supported by a solid and efficient community. For this, we need appropriate tools: a platform (notably a digital platform), a suitable framework, fluid and reactive, neither too much organized nor too diffuse, and financial resources as well! The various States and Governments should not supervise the work and interactions, but should provide minimum resources to ensure that these works and interactions can indeed occur, grow and lead to concrete results. The example of the W20 community can be a very good starting point. But there is the question of continuity from one year to the next. In the case of W20, some heritage is transmitted since the creation of the W20 during Turkish presidency. And next week, actually, there will be a meeting at the Argentinian Embassy in Tokyo, for the W20 Argentina handover and the W20 Japan Kick off. But more stable momentum is definitely needed. I think it is also the responsibility of the G7 and G20 governments to ensure some sort of continuity. Remember, in particular, that the various stakesholders and Delegates have been working solely on their own resources so far, and unfortunately we all know the limits of that. And in addition this creates a bias and some imbalance between different types of stakeholders (depending on the resources they can deploy on short term or long term), which is of course detrimental to multistakesholderism as such. Finally, coming back to Digital issues, #JamaisSansElles has several ideas and subjects to push forward of course, but this is not the place to discuss them. From the general point of view, we believe that a gender balanced perspective should be adopted throughout, and gender diversity should be ensured at all levels of reflection, decision and action. Surely, this view is shared more and more widely, especially in the Digital ecosystem. 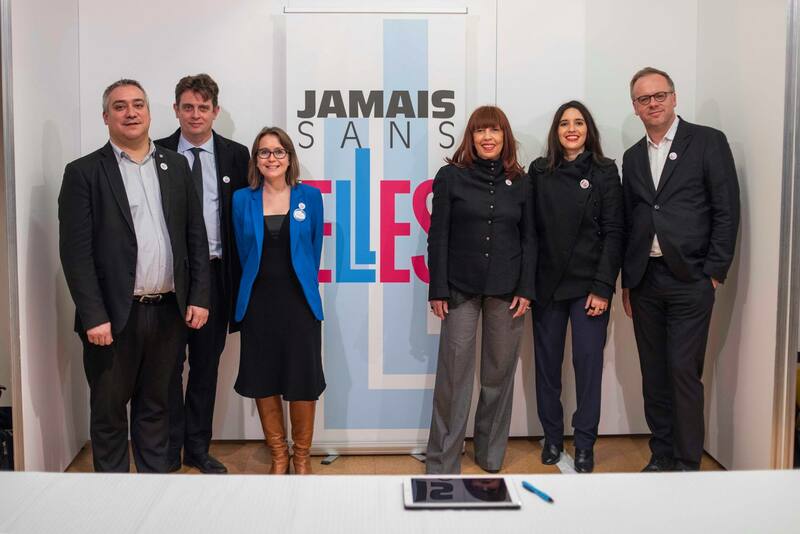 A few months ago, #JamaisSansElles co-elaborated a dedicated Charter together with Microsoft France, which is very proactive in this direction. We also announced last Monday a pledge aimed at internet governance organisations, think-tanks and decision-making bodies. The first signatories are ISOC-France, Reporters Without Borders and The Think Tank Renaissance Numérique, and we’re inviting all internet governance organisations to sign it as well. This is also part of multistakesholderism, in the sense that actions and commitments can indeed emerge from the civil society and economical actors, and generate experience that can then be shared, transplanted or adapted elsewhere. Another important example is of course education, which is key for Digital economy. Innovative Digital schools have recently attracted a lot of attention in France, for their flexibility and their ability to target left-aside students who sometimes did not fit and succeed in school, but can react very positively to innovative pedagogies. And these can be installed locally, in disfavored environments, and really change the deal. To finish, let us keep in mind that all these efforts make sense only in view of a more ethical, more pacified, equitable and more inclusive world. The technology is what it is, but the digital revolution must be humanist, and, as we strongly believe at #JamaisSansElles, feminism is a humanism!